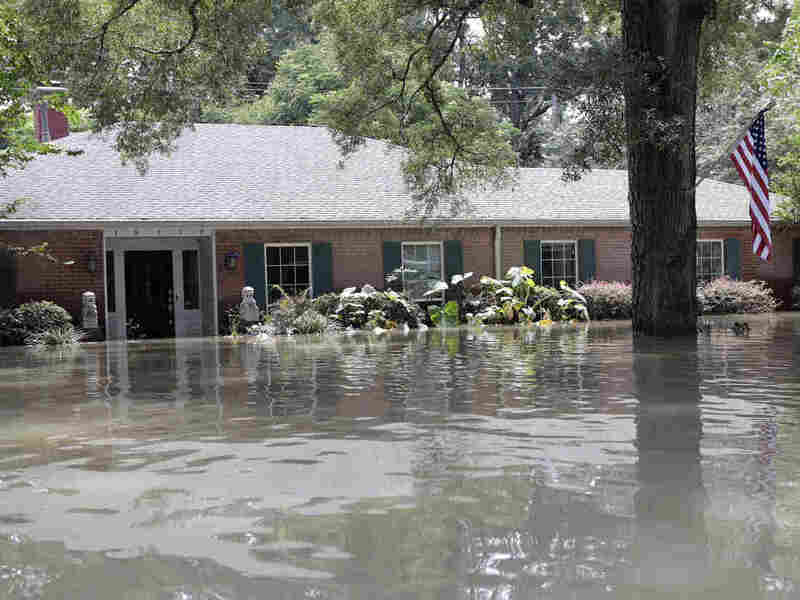 Texas Governor Announces A Half-Billion Dollars For Hurricane Harvey-Hit Areas : The Two-Way The latest federal recovery money is intended to pay for projects such as buying out flood-prone properties and building better drainage systems. Texas Gov. Greg Abbott announced more than $500 million in hazard mitigation funding provided by FEMA is available immediately. He expects the state to receive at least $1.1 billion in aid by August. Texas Gov. Greg Abbott wants to start cutting checks for victims of Hurricane Harvey starting now. At a meeting with business leaders in Rockport, Texas, Tuesday — one of the areas slammed hardest by the storm — the governor announced the state expects to receive more than $1 billion in hazard-mitigation funding from the Federal Emergency Management Agency by next summer. Five hundred million of that is available immediately. "The money is here, checks can be cut immediately as soon as you get your applications in and get them approved by [the Texas Division of Emergency Management]," Abbott told the crowd, according to The Texas Tribune. He also added that the agency's chief, Nim Kidd, knows "there's a need for speed." The help comes six months after Hurricane Harvey devastated the Texas coast. A statement from the governor's office gives a list of eligible projects that includes buying out flood-prone properties and building dams and floodwalls. The Tribune mentions "retrofitting houses and buildings to withstand hurricane winds." Abbott remarked at the meeting, "We want to rebuild in ways that reduce the risk of future damages to property and to lives," according to Corpus-Christie's Caller-Times. Abbott said the state expects to receive the second portion of federal dollars by the anniversary of the storm in August. He said the final sum could exceed $1.1 billion "if it turns out that cities, counties, schools and individuals provide FEMA with more evidence than currently exists of assistance that is needed in this region," the Caller Times reported.